Throughout 2018 the Egyptian Armed Forces have been following through in five strategic courses of action: the fight against terrorism, epitomised this year by the launch of Comprehensive Operation Sinai (COS) 2018; modernisation of the Armed Forces; building capacity to respond to evolving threats; participating in national developmental efforts in the framework of a civilian-army partnership and strengthening regional and international military relations. Egypt continued the battle against terrorism on various levels, including COS 2018. Launched in February this year, COS 2018 set two strategic goals: to eradicate terrorism from Sinai and stabilise the peninsula in readiness for wide-ranging development. The realisation of these aims through operations targeting terrorists was documented in 29 official military communiqués released over the last 10 months. Considerable progress has also been made towards eliminating terrorist recruitment, tightening the security of maritime and land borders and fighting illegal migration. Armed Forces Spokesman Colonel Tamer Al-Rifaai recently provided an overall assessment of COS 2018. He reported that since the operation began 450 terrorists had been killed, 1,200 triggered explosive devices planted along military routes disabled, and 900 vehicles and 1,000 motorcycles used by terrorists in Sinai destroyed. Soldiers and police also destroyed 420 farms growing drugs and confiscated 118 tons of narcotic substances as well as 24 million illegal tablets. Fifteen tunnels used to smuggle terrorist operatives, arms and drugs beneath the Sinai-Gaza border have been destroyed since COS 2018 began. Security along the border was tightened by the creation of a 5km deep buffer zone. The zone was cleared over several phases and involved the relocation of residents and payment of LE1.38 billion in compensation. A 1,016 unit residential complex was built in Rafah to accommodate displaced families. In terms of daily life, markets, schools and public transport systems are now operating normally. The army has ensured food supply lines and healthcare services are working and reopened the international highway and other major routes in central and northern Sinai. The success of COS 2018 is obvious in the collapse of terrorist activity. Communication channels between terrorist cells in Sinai have been destroyed and avenues of escape have been sealed. Attempts by terrorist groups in the peninsula to occupy territory to serve as a base for expansion were thwarted in contrast to the situation in Iraq, Syria and Libya where Islamic State (IS) group and Al-Qaeda acquired territorial footholds. When formulating the objectives of COS 2018, planners and strategists took into account the fact that it is impossible, practically speaking, to end terrorism entirely. Eliminating an environment conducive to terrorism and reducing the phenomenon to the minimum are, however, attainable goals. This point was made by President Abdel-Fattah Al-Sisi, supreme commander of the Armed Forces, in a speech during the presidential campaign in March 2018, a month after COS 2018 was launched. He said Egypt could eliminate 90 per cent of terrorism but the phenomenon would persist because of the regional situation. Egypt’s counter-terrorism goals extend beyond the bounds of COS 2018. Discussing Egypt’s broader vision during the Munich Security Council in February this year, Foreign Minister Sameh Shoukri warned that military victory over IS should not be viewed as the end of the fight against terrorism but as an important step towards dismantling and eliminating terrorist networks. He stressed that Egyptian policy is to regard IS, the Nusra Front, Hayaat Ahrar Al-Sham, Ansar Beit Al-Maqdis and Boko Haram not as discrete groups but as emanations of the same ideology, movements that coordinate one with the other, and that terrorism will not be uprooted until the grounds in which extremism thrives are radically overhauled. This goal cannot be achieved by security and military measures alone. As Shoukri said, a balance must be maintained between the security and developmental dimensions of the fight against terrorism. To forestall the recruitment of new terrorists it is necessary to strike at the roots of the social, economic and ideological causes of extremism. The last 12 months have seen a continuation of the drive to develop and modernise the organisational and logistical capacities of the Armed Forces that began four years ago with a focus on infrastructural development such as the construction of military bases and the setting up of new military commands. 2018 saw the inauguration of the East of the Suez Canal Command Headquarters. The new command centre’s role is to facilitate counter-terrorist operations and to better enable the Armed Forces to carry out the two-fold mission of protecting national security and supporting a comprehensive development process in Sinai. 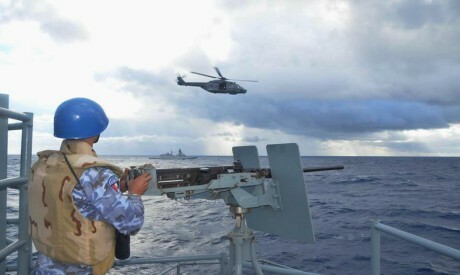 A second infrastructural advance this year occurred in the framework of the drive to expand the domestic arms industry. In this respect the production of the first Egyptian-made Gowind-class corvette by the Egyptian Navy’s Alexandria Arsenal Company in cooperation with the French Naval Group represents a major milestone. The growth of domestic military production was on show during the first Egyptian Defence Exposition (EDEX) launched in December this year. EDEX-1 showcased the boom the Armed Forces has experienced in domestic industrialisation and the expansion of advanced technology joint manufacturing projects with other countries. Progress in enhancing threat management and danger response capacities in 2018 was achieved by means of bilateral and multilateral military exercises. This year saw a rise in the number of drills with European partners, the US and Russia. The most significant joint exercises were the Bright Star manoeuvres with the US, Cleopatra with France, Medusa with Greece and Cyprus and the Defenders of Friendship with Russia. Drills with these and other European countries, including the UK and Spain, took place in the Mediterranean and Red Sea regions. Egypt also engaged in multilateral military exercises with fellow Arab countries. The Arab Shield manoeuvres brought together forces from Egypt, Saudi Arabia, Jordan, the UAE, Bahrain and Kuwait with Morocco and Lebanon attending as observers. Arab Shield is an attempt to form the kernel of a joint Arab force equipped to contend with regional security threats and revive a collective security system. The manoeuvres drew on the latest advances in training methodologies, applying them in operational theatres presenting severe and unconventional threats. The Yemen war has increased the dangers posed by naval mines and several exercises were designed to hone naval forces’ ability to defuse mines planted in Yemeni coastal waters. Egypt’s territorial waters have acquired enormous economic significance following the discovery of natural gas fields in the Mediterranean and joint exercises between Egypt, Greece and Cyprus in the Eastern Mediterranean were designed with this in mind. Other pressing concerns have contributed to shaping the training programmes. Egypt’s European partners are keen to include exercises in the Mediterranean designed to curb illegal migration from Africa to Europe. Another highlight of the year was Egypt’s contribution to the establishment of the counter-terrorism centre for the Sahel and Sahara, bolstering military relations with African states. Egypt hosted counter-terrorism exercises with countries from the Sahel and Sahara region which provided training on dealing with armed groups and freeing hostages. The exercise aimed to provide African special forces with experience of working with friendly countries during emergency situations. The role of the Armed Forces in development was exemplified by their infrastructural contributions in Sinai. Since it was returned to Egypt the peninsula has remained outside developmental efforts. Now, though, LE275 billion has been earmarked for northern Sinai development. The budget will support the government and the army in the complementary roles they play in a development process which to a large extent has been shaped by national security priorities and the need to integrate Sinai with the Nile Valley and Delta. Comprehensive development extends beyond needs such as housing and urbanisation. It includes industrial and agricultural growth to create jobs and reduce dependency on imports, healthcare, education and culture. The army is engaged in projects to increase the area of cultivated land and to expand the manufacturing base as well as major infrastructural schemes such as the Nasr Floating Bridge, the first bridge of its kind to cross the Suez Canal. The army has constructed new cities — New Ismailia and New Rafah — and in May 2018 laid the cornerstone of Salam Misr city. The new urban centre is planned as the economic capital east of Port Said. It will bolster the process of assimilating Sinai into the national fabric and augment the peninsula’s ability to attract domestic and foreign investment. In the course of its drive to bolster military relations with other states, multi-faceted joint military manoeuvres have been held, high-level military visits arranged and Egyptian officials and experts have been regularly invited to contribute to international conferences on security-related issues. Egypt views military and security relations as an inseparable part of its foreign relations and has pursued them vigorously over the course of the year. Its success in doing so was clearly displayed when the first Egyptian Defence Expo (EDEX-1) was launched this year and attracted 65 military delegations from around the world. The Armed Forces’ contributions extend beyond the army’s conventional duties to embrace a variety of functions and services in crucial areas. While the army’s core mission is to protect and secure the country, the additional roles it plays reflect a surplus strength that is invested in bolstering the Egyptian state. The military establishment has become a major player in domestic development though it must be stressed that it has assumed this developmental function in partnership with the government and civil society.